LAOLA wurde 2012 in Galizien im Norden Spaniens geboren. Seitdem sind wir mit der gleichen Philosophie aufgewachsen, viel Spaß bei allem was du tust! 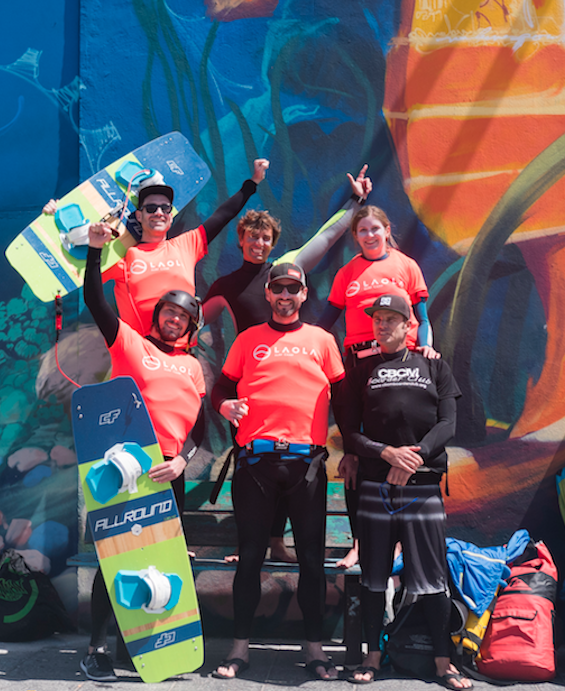 Anfangs waren wir nur auf der Surfschule und im Surfcamp, aber 2012 kamen wir auf Fuerteventura, wo wir Stand Up Paddle Kitesurfing Kurse anbieten. Unser Surf House bietet Yoga-Stunden und Massagen für unsere Gäste an. Alle unsere Aktivitäten sind auf Ihr Niveau angepasst, Sie müssen kein Experte sein, um nach Laola Surfcamp zu kommen. THE BEST WAY TO IMPROVE YOUR SURFING. PRIVATE LESSON, OUR COACH WILL BE ONLY WITH YOU DURING THE SESSION. VIDEO ANALYSIS, QUIVER OF MORE THAN 150 BOARDS, ALL LESSONS GIVEN IN YOUR MOTHER TONGUE. (FRENCH, SPANISH, ENGLISH). THIS IS OUR BEST SELLER, STAY IN OUR SURF HOUSE SURF EVERYDAY WITH SURFER OF YOUR LEVEL WITH SURF INSTRUCTORS WHO KNOWS PERFECTLY ALL THE SPOTS OF THE ISLAND. THE BEST AND MOST FUN WAY TO SPEND YOUR SURFING HOLIDAY IMPROVE YOUR SURFING AND MEET NEW FRIENDS. Surf lessons of 4 hours transport and material included in price. Learn to surf in a safe environment with professionals. 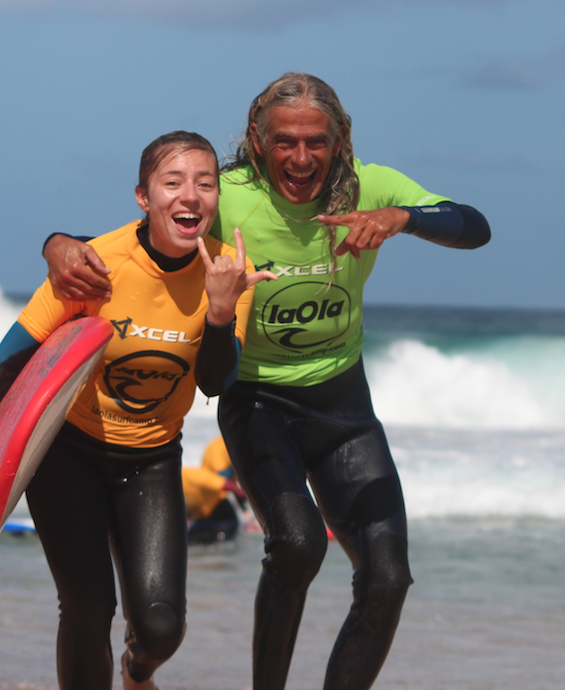 In LAOLA Surfcamp you will find Surf Instructors with a high experience in teaching surfing. You will surf with a groupe of other surfer with the same level as yours. All our surf lessons are adapted to your level, we divid the groups in 3 mains categories, beginners, intermediates and advanced. The length of our surf lessons are about 4 hours transport included. 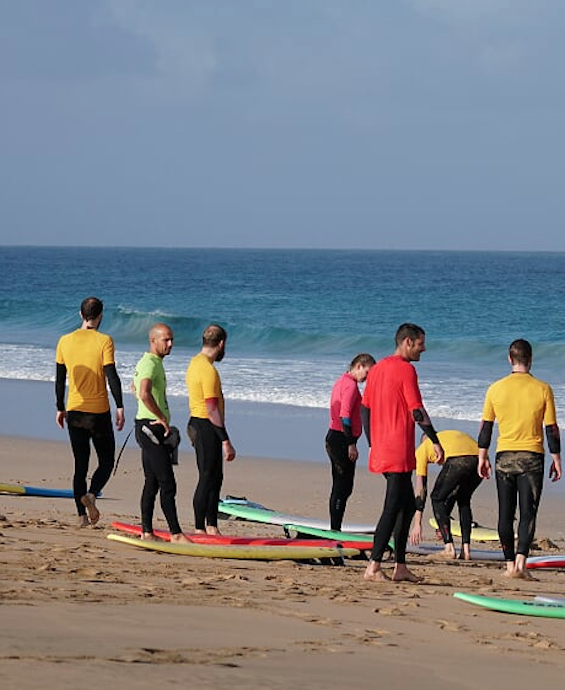 All surf instructors in LAOLA SURFCAMP are surf instructors from the Spanish federation of Surfing or from the Canarian Federation of Surfing. We all have many years of experience in teaching surfing. In our team of instructors we have instructors who speaks French, English and Spanish. For thoses who have a more advanced level you can count on our very experienced surf instructors in competition in our team we have a European Champion and also some Spanish and European competitors. What's the best period of the year to come surfing in Fuerteventura ? In Fuerteventura you can learn to surf all year long in a temperate climate. The best season for more advanced surfer it’s between September and May, for those who are at their very beginning in surfing anytime during the year will be good and fun. This package is specially design for thoses who are at their very first steps of kitesurfing and who want to learn in a safe environment. Lessons will be given in French, English and Spanish. Unsere Kitesurf-Woche ist speziell für diejenigen gedacht, die ihre Kitesurf-Technik verbessern oder das Kitesurfen zum allerersten Mal entdecken möchten. Gruppen nach deinem Level. Maximal 4 Personen pro Gruppe. The program include safety rules, navigation basics but also lessons with contact radio with you instructor once you are sailing. The first 2 days we will start the lessons from the beach and then we will go with our boat. 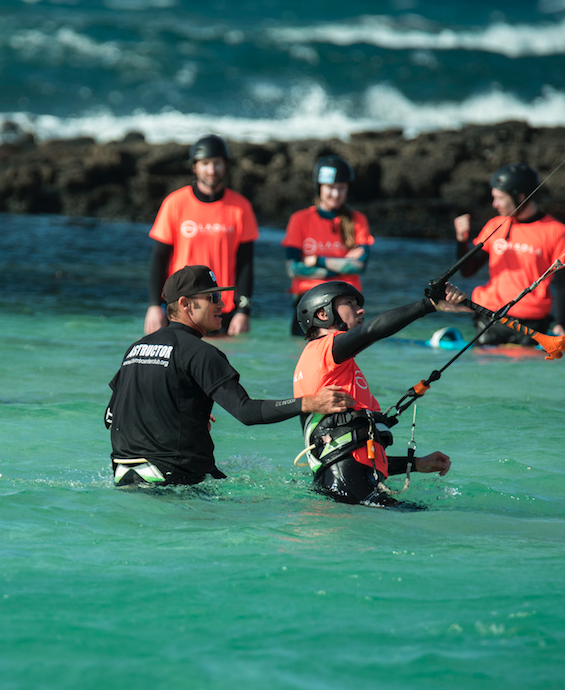 Our instructors are certified by the French Kitesurf association (BEP). Alle unsere Kitesurf-Kurse sind auf Ihr Niveau angepasst, unsere Gruppen sind von 4 Personen maximal und von 3 Händen Kategorien, Anfänger, Fortgeschrittene und Fortgeschrittene. Die Dauer unseres Kitesurfkurses beträgt ca. 4 Stunden Transport inklusive. All kitesurf instructors in LAOLA SURFCAMP are kitesurf instructors with the French Certificat of Kitesurfing Instructor (Brevet état) . We all have many years of experience in teaching kitesurfing. In our team of instructors we have instructors who speaks French, English and Spanish. For thoses who have a more advanced level you can count on our very experienced kitesurf instructors. We have the best material at your disposition and a boat for security in case we go to sail in open water. Safety is our first priority their is nothing more important than safety for us. If for any reasons we are not feeling that a lesson should be given we will cancel the lessons and refund 100% of your money.All surf instructors in LAOLA SURFCAMP are surf instructors from the Spanish federation of Surfing or from the Canarian Federation of Surfing. We all have many years of experience in teaching surfing. In our team of instructors we have instructors who speaks French, English and Spanish. For thoses who have a more advanced level you can count on our very experienced surf instructors in competition in our team we have a European Champion and also some Spanish and European competitors. What's the best period of the year to come for kitesurfing in Fuerteventura ? 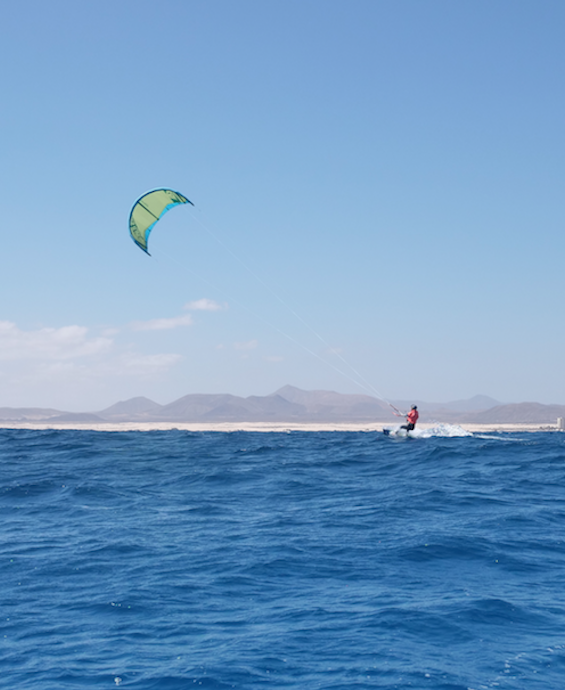 In Fuerteventura you can learn to kitesurf all year long in a temperate climate. The best season for more advanced kitesurfer it’s between may and september, for those who are at their very beginning in kitesurfing anytime during the year will be good and fun. SUP lessons for all levels, we adapt the lessons according to your level we can offer SUP lessons in lagoons or in open Ocean. Tai Chi lessons are given in an outdoor environment most of the time at the beach or somewhere between the volcano of Fuerteventura..
During your Zen week we will do at least one Trekking to one of the Volcanos of the island. The duration of the shortest trekking we do is about 3 hours. In case one of the SUP lessons has to be canceled we usually as a substitute offer the possibily to do a Trekking according to the customers choices. Our teacher will adapt the yoga lessons to your needs and to your level. Usually we do the yoga class outdoor but if the weather is not good enough we have the possibility to do Yoga lessons on an inside environment. During your stay at the Zen Camp, you will enjoy our 5 bedrooms villas with heated swimming pool and all the modern facilities. Each room with a private bathroom, flat screen TV and wi-fi in all the rooms. Wir bieten sowohl Kitesurfern als auch Surfern die Möglichkeit in unseren Villen zu wohnen. In unserem Surfcamp wirst du 100% Surf Life Chill Atmosphere, lokales Essen, neue Surfkameraden und jede Menge Spaß erleben! Alle Räume sind für maximal 2 Personen mit einem zusätzlichen Raum. Geräumiges Zimmer, Grill, Bier Kühlschrank, kostenlose Küche, Pool, Carver Skate, Yogamatte, kostenloses Handtuch und Reinigung jeden Tag unseres Rennens Kuka. Unsere Zen-Villa besteht aus fünf Schlafzimmern mit eigenem Bad und einer privaten Terrasse. Die Zimmer sind 24 m2 groß und mit einem Flachbild-TV ausgestattet. Grill, Bierkühlschrank, freie Küche, Pool, Yogamatte, kostenloses Handtuch und Eating-Schwimmbad bei 28 Grad! El descubrimiento de Tai Chi con Alfonso, clase de yoga muy relajante con Erika, dos vistas de trekking impresionante, la práctica de remo en un entorno magnifque, muy, muy buenas comidas por la cocción de Rodolf, masaje alta calidad (relajante o deportivo) con Thomas y por no hablar de una casa muy agradable con todo lo necesario para una buena estancia.